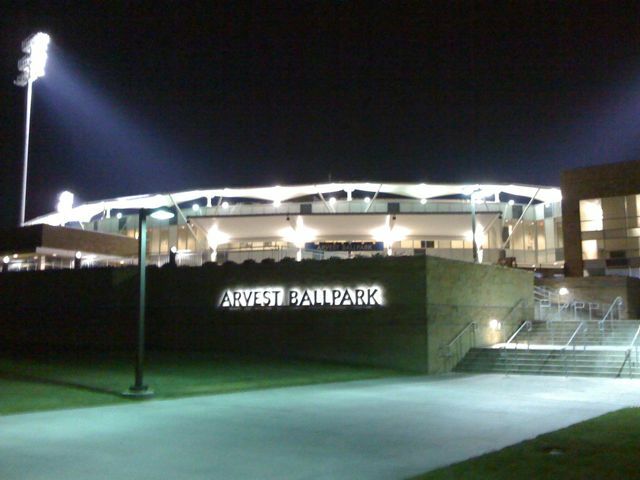 Springdale, AR – John Lamb is set to try and pick up his first Texas League win tonight at the beautiful Arvest Ballpark against the Frisco RoughRiders, Texas Rangers affiliate. Colleen (my wife), Paige (John’s girl-friend), Tony Piazza (close friend) and I will be in the crowd to watch the Northwest Arkansas Naturals, Kansas City Royals affiliate, attempt to get two wins in as many nights since returning home. Despite the strange bird noises coming from our backyard at home in Southern California, Colleen seems to be enjoying the buzz of the locust and the crickets popping around the ground. She is simply having some childhood flashbacks from growing up in Missouri. The Naturals fans were entertained by Danny Duffy and Patrick Keating from the mound last night. Timely hitting and a late inning pass ball helped the Naturals clip the RoughRiders by a final score of 4-3. I am always happy to watch a professional baseball game for obvious reasons. It helps me with my scouting at the amateur level. Throw in the chance to see my son for the first time this season and you have a special day at the ballpark. We are very grateful with the chance to watch my son tonight. Not only marking his 25th start of the season but having the possibility to experience his first Double-A level win in the Texas League could be the making for a special night at the ballpark. Reluctantly, I say thanks for the visit and comment…no matter how ill advised!